Hydra Therapy is a targeted solution-specific skin therapy formulated to work continuously to restore moisture and fortify the skin, while addressing skin aging with ingredients that encourage cell renewal and the rebuilding of connective tissue. Skin that is dry and/or sensitive tends to have impaired skin barrier function and diminished natural moisturizing factor (NMF). By restoring these skin functions, Hydra Therapy encourages healthy skin repair, thus healthier skin appearance is gained. 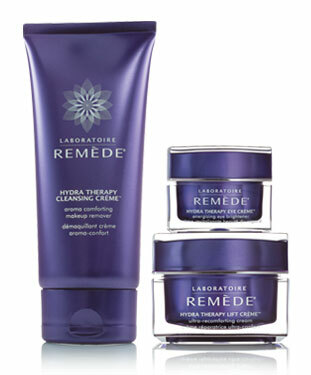 Hydra Therapy includes Laboratoire Remède's exclusive Green Defense for environmental protection and delivery system SRT-21 for optimal skin performance.